Ultrasound for predicting the suitable nostril for nasotracheal intubation: Look before you leap! Complications of nasotracheal intubation range from trauma to patient by endotracheal tube (ETT) (epistaxis, avulsion of nasal turbinates) to trauma to ETT by the patient (distorted anatomy, nose pins causing cuff rupture)., Ruptured cuff may cause aspiration, anaesthetic gas leak along peritubal space and ineffective ventilation leading to hypoxia., Forewarned is forearmed. We describe a clinically viable, non-invasive, radiation free and point of care (POC) sonographic technique which can predict and prevent these complications. A 35-year-old, 60 kg male, carcinoma right buccal mucosa patient, was planned for the Commando surgery. An awake fibreoptic bronchoscopic (FOB) tracheal intubation under nerve blocks was planned through the more roomy appearing left nostril. A well lubricated, 7 mm ID flexometallic cuffed endotracheal tube (FMCETT) pre-loaded over an FOB (4.2 mm diameter) was smoothly railroaded into trachea. On attempting cuff inflation, cuff was found to be ruptured. On replacement with another FMCETT over a tube exchanger, same problem recurred. Concurrent analysis of the magnetic resonance imaging (MRI) image revealed a sharp spur in left nasal cavity prompting us to attempt nasal intubation via the right nostril. Cuff of the third FMCETT, was found to be intact. This was confirmed by absence of peritubal leak over larynx on palpation and auscultation, sonographically (sustained tracheal dilatation in the suprasternal region) and with aneroid manometer. Auscultatory and capnographic confirmation of FMCETT placement was done. 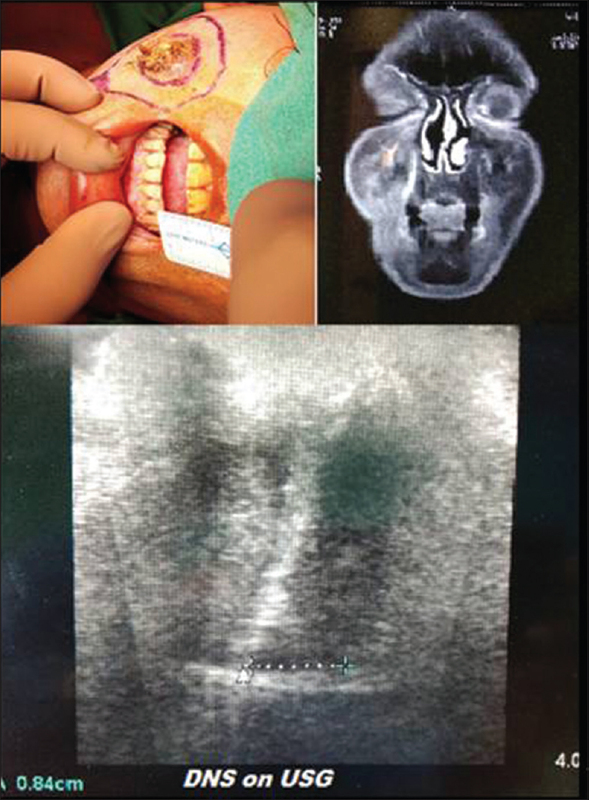 A retrospective ultrasound of the nasal cavity verified the presence of deviated nasal septum (DNS) and nasal spur. Assessing nasal patency by inserting clinician's lubricated, gloved, little finger into the patient's nostril, is crude. Anteriorrhinoscopy does not reveal posterior nasal abnormality. Flexible endoscope/FOB provides detailed examination of the entire nasal cavity for nostril selection. Rhinomanometry, acousticrhinometry and nasal peak flow provide little clinical value in nostril selection. Imaging techniques mention techniques involving radiation (X-ray paranasal sinus occipitomental view, panoramic or posteroanterior skull radiography and computed tomography) without providing working anatomical knowledge for clinical interpretation. Head and neck oncosurgical patients have MRI/computed tomography (CT) scan image displayed in OT [mandated by the World Health Organization (WHO) safety checklist]. After excluding common causes of cuff rupture (thermosoftening of ETT, fixed nose pin, Magills forceps handling, use of spray formulation of lignocaine lubricant), we scanned the MRI-scan for pre-existing nasal pathology. A prerequisite to utilize imaging and perform preoperative nasal cavity ultrasonography is knowledge of nasal anatomy. Nasal cavity is bifurcated by nasal septum, which comprises cartilaginous and osseous portions. Lateral nasal wall includes three paired turbinates. The inferior turbinate (largest) runs along the nasal floor while superior turbinate (smallest) is attached to the skull base. Tube can be introduced through the nasal cavity through a lower pathway which lies along the nasal floor (safer and preferred) and an upper pathway between the inferior and middle turbinates. The narrowest portion is the nasal valve (upper lateral cartilage, anterior end of inferior turbinate laterally and septal cartilage medially). Anatomical variations (concha bullosa, septal deviation, spur, nasal polyps and mulberry turbinates) seen in two-third of oral surgery patients can cause unilateral obstructions, impaired airflow dynamics and complications during nasal intubation. Coronal view of the nasal cavity is excellent for visualizing nasal turbinates, DNS, nasal spurs, spines and other pathology. Coronal CT-images at inferior turbinate-anterior end, middle turbinate-anterior end and middle turbinate-middle portion are useful. A vertical line connecting the base to the top of nasal septum is drawn. If the nasal septum is bowed >2 mm from this line and the distances between the inferior concha and septum are reduced, a diagnosis of DNS is made. About 15 MHz linear ultrasound probe position and sonoanatomy [Figure 1] in both axial and coronal (easier to decipher) views detects septal deviation. The alar cartilage is seen as layers of hypoechoic and echogenic bands while the septal cartilage has a homogenous hypoechoic appearance. Mladina and Bastaic classified DNS as 1: midline septum or mild deviation; 2: anterior vertical, C-shaped; 3: posterior vertical, C-shaped; 4: S-shaped deviation; 5: horizontal spur; 6: horizontal spur with deep groove on the concave side; 7: combination. All subtypes may cause varying degrees of epistaxis, while types 5–7 are liable to cause ETT cuff rupture. We advocate that, preoperative, POC nasal cavity ultrasound along with scrutinizing the radiological anatomy can go a long way in averting complications due to nasotracheal intubation. Hall CE, Shutt LE. Nasotracheal intubation for head and neck surgery. Anaesthesia 2003;58:249-56. Green MS, Hoffman CR. An unusual cause of nasotracheal tube cuff equipment failure. J Clin Anesth 2012;24:600-1. Shah SB, Bhargava AK, Goyal P. Armored tubes: An unusual chink in armor! Indian Anaesth Forum 2016;17:65-6. Nakamura S, Watanabe T, Hiroi E, Sasaki T, Matsumoto N, Hori T. Cuff damage during naso-tracheal intubation for general anesthesia in oral surgery. Masui 1997;46:1508-14. Dubey PK, Dubey P. Point-of-care ultrasonography for detection of tracheal tube cuff rupture following nasal intubation? Saudi J Anaesth 2018;12:369-71. Smith JE, Reid AP. Asymptomatic intranasal abnormalities influencing the choice of nostril for nasotracheal intubation. Br J Anaesth 1999;83:882-6. Chi SI, Park S, Joo L-A, Shin TJ, Kim HJ, Seo K-S. Identifying the more suitable nostril for nasotracheal intubation using radiographs. J. Dent Anesth Pain Med 2016;16:103-9. Thota RS, Doctor JR. Evaluation of paranasal sinuses on available computed tomography in head and neck cancer patients: An assessment tool for nasotracheal intubation. Indian J Anaesth 2016;60:960-1. Gossner J. Sonography of the nasal cartilage: Technique and normal anatomy. J Ultrasound 2014;17:317-9. Mladina R, Bastaic L. What do we know about septal deformities? J Rhinol 1997;2:79-89.